Which Wulftec Stretch Wrapping Equipment Is Best For Your Needs? Home | Hughes Enterprises Blog | Equipment | Semi Automatic Vs. 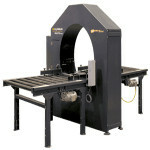 Fully Automatic: Which Wulftec Stretch Wrapping Equipment Is Best For Your Needs? Consistency and efficiency are among the most important elements for a successful packaging operation. Because of the inconsistencies that come with stretch wrapping by hand, many savvy companies are finding it worth-while to implement a stretch wrapping machine. Wulftec stretch wrapping equipment can fulfill any unique packaging need for any industry, but choosing the right machine for your distribution center can be a struggle. Do you need semi-automatic or fully-automatic? We’re here to help you choose wisely. Because, the last thing between a pallet of your goods and the back of a delivery truck is a stretch wrapper. It’s important that you make the right choice. Low Profile Semi Automatic or High Profile Semi Automatic– If you’re handling low-volume applications (fewer than 20 loads per hour), a semi automatic stretch wrapper may be the best solution for you. The Wulftec SMART Series of semi-automatic low and high profile turntable stretch wrapping systems offer a smart approach to semi-automatic stretch wrapping. Low Profile Fully Automatic or High Profile Fully Automatic– If you’re handling higher volume applications (20-120 pallets per hour), a fully automatic stretch wrappers may be right for you. This wrapper interprets the pallet height of each load to the film carriage which ensures a professional and efficient wrap every time. Turntable stretch wrappers are ideal for wrapping stable loads of under 8,000 lbs. They’re typically used for low to medium volume users. Because of their smaller footprint, this choice is a definite asset when space is at a premium. Conveyorized – Wulftec has built a solid reputation on being experts in the conveyor industry with multiple conveyor solutions for all industries. It’s an investment in all steel construction, for increased stability and strength. It’s an investment in success, because Wulftec® equipment is designed and built to last load after load, year after year. Automatic Rotary Arm– Automatic stretch wrappers maximize throughput and efficiency. They take care of everything; you only change the roll of film. An automatic stretch wrapper will save significant time and money. They can keep up with even the most demanding production rates. They can wrap almost anything. 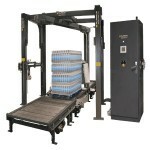 Since the load remains stationary, they are ideal for wrapping very light, very heavy, tall or unstable loads. Horizontal – A great alternative to strapping, taping, poly bags, corrugated materials or other unitizing methods. The horizontal stretch bundler is the preferred way to wrap long products that can’t be wrapped on conventional wrapping machines. Plus, it minimizes total packaging costs (labor and materials) compared to hand wrap. Hughes has a partnership with Wulftec, the leading supplier of pallet stretch wrapping machines for many industries. Industries like distribution centers, beverage, poultry, beef, pork and seafood as well as lumber, mulch, newspaper, corrugated boxes, and commercial printing. We can offer an efficient stretch wrapping solution, no matter the variation of your pallet loads. 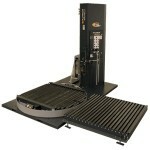 Need help deciding which Wulftec stretch wrapping equipment is right for you? Give us a call at 267-409-6100 to speak to one of our packaging consultants and engineers.